When one sees the word “pesto” in a recipe, the usual assumption to make is that it is a basil pesto, or Pesto Genovese. In reality there are so many other options to consider when making a pesto sauce for pasta as a pesto sauce can also be made using mixed herbs, sun-dried tomatoes, peppery arugula, or even basic broccoli as I have used in this recipe. Broccoli is great for using in a pesto sauce although it does need a couple of other ingredients to help bring it to life and make the sauce more vibrant tasting. This dish is healthy as well as being both easy and quick to put together. In fact, this is one of those pasta dishes that can be started and finished and on the table in under thirty minutes. The broccoli is first cooked until tender in the pasta water which is then used to cook the pasta, helping to infuse the pasta with the broccoli flavor. I used Barilla Plus farfalle pasta to keep this dish as healthy as possible, but you could use any pasta type you prefer. Although I used up all of my broccoli in my pesto sauce, you can also cook extra broccoli and set it aside until you are ready to toss together the sauce and pasta. At that time, simple add in the additional cooked broccoli florets to the pasta and sauce and toss together. The recipe below is my basic recipe that you can tweak to your own preference. If you like things spicy, simply add in additional red pepper flakes, or substitute a finely chopped red chile pepper for the flakes altogether. If you love the salty flavor of anchovies, feel free to add extra to the sauce, but just be careful not to add additional sea salt until you have finished blending the anchovies into your pesto as the anchovies can be quite salty. Although olive oil is in fact a very healthy fat, if you wanted to make this dish lower in fat calories, simply reduce the olive oil by half and use the pasta cooking water to replace the oil removed. Broccoli’s most important nutrients include vitamin C, vitamin A, folic acid, calcium, and fiber. Olive oil is a heart healthy oil but you can reduce the amount of oil further and use some pasta water in place of some of the oil if you prefer. Using a whole grain or enriched pasta add nutritional value to every bowl of pasta. Broccoli is used to make a healthy pesto sauce the entire family will love. Bring to boil, a large pot (pasta pot) of lightly salted water, and cook the broccoli for about 3 minutes or until tender. Remove the broccoli with a slotted spoon and set aside, and then add the pasta to the water the broccoli was cooked in and cook until "al dente". While the pasta is cooking, place the broccoli in a food processor with the parsley, pine nuts, lemon juice and zest, anchovy fillet, garlic, capers, and red pepper flakes. Add half the olive oil and pulse. Continue to pulse additional the rest of the olive oil until you have a thick, smooth sauce. When the pasta has cooked, drain, reserving half a cup of the pasta water and return the pasta to the pot. Toss the sauce and pasta together, adding in a little of the pasta water to loosen the sauce and ensure it covers the pasta well. 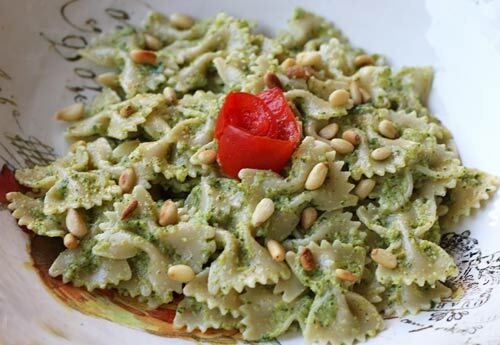 Serve in individual pasta bowls topped with a sprinkling of pine nuts. Pass the grated cheese at the table.